Cmart - McClung va Great fit "Wore these for the first time and they are awesome. Like the colors and the fit"
SmithJR - Traverse City, Michigan Great racing pants. "Wore the first time at the Battle Creek, Michigan Sprint Enduro. Pants and Jersey held up well. I stayed cool in this gear, no sweating or overheating. Thanks for the great product ." 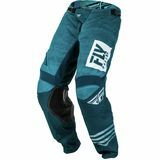 Dirt bike pants offer the most comfortable and functional leg protection available for riding. Sure, you can wear jeans but racing Moto or blazing down trails requires flexibility for protective gear and adequate ventilation so you don't overheat. So leave the constricting denim at home. Motocross pants prevent scrapes and cuts thanks to the durable rip-resistant materials like nylon, polyester and mesh fabrics. The reinforced knee panels and stretch zones bring maximum comfort and precise areas of safety. A variety of sizes and styles exist to complement everyone's taste. 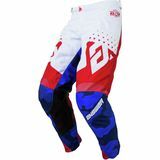 MotoSport carries the most popular manufacture brands of dirt bike pants. Look for the same pair your favorite rider wears right here. Then check out our dirt bike jersey section to mix and match or if you need gloves too, grab the whole riding gear setup with our pants, jersey and gloves combos. The Sizing Charts helps you find the right fit and if you have questions, please give us a call at 888-676-8853. Spend more than $79 and we'll send it free, either way we get it to you fast so you're ready for ride day.